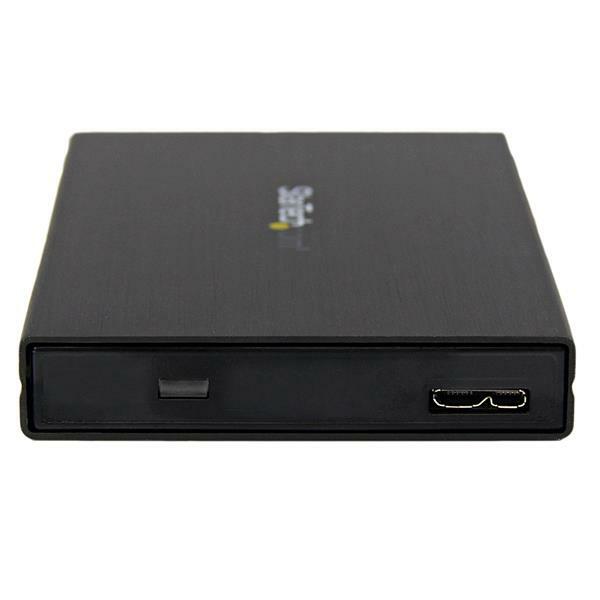 The S2510BMU33 USB 3.0 Hard Drive Enclosure with UASP lets you connect a 2.5in SATA III hard drive (HDD) or solid state drive (SSD) through an available USB port. The enclosure delivers optimal performance with a USB 3.0 connection, but is backward compatible with USB 2.0/1.1 host connections as well. Enhanced with UASP (USB Attached SCSI Protocol), this 2.5" SATA III enclosure performs up to 70% faster than conventional USB 3.0 when paired with a UASP-enabled host controller. Using a more efficient protocol than the traditional USB BOT (Bulk-Only Transport), UASP reduces latency, significantly increasing transfer speeds and reducing processor usage to utilize the full potential of your SATA III hard drives. See our UASP testing results below for further details. With support for SATA I/II/III, and large capacity drives (tested up to 1TB) this HDD enclosure is compatible with virtually any 2.5in SATA hard drive, and greatly increase the storage/backup capabilities of your computer. 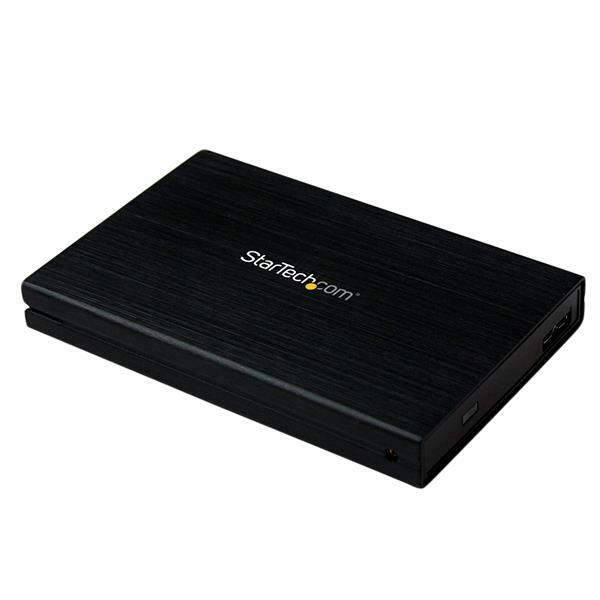 The USB 3.0/SATA III enclosure requires no external power adapter and features high quality aluminum construction, ensuring both portability and durability when carried as a laptop accessory. To ensure compatibility with your computer system, the S2510BMU33 supports all of the leading operating systems, including: Microsoft Windows® (8/7/Vista/XP/Server 2008/Server 2003), Apple® OSX (10.9/10.8/10.7/10.6), Linux, and Google Chrome OS™. UASP is supported in Windows 8, Mac OSX (10.8 or above), and Linux. 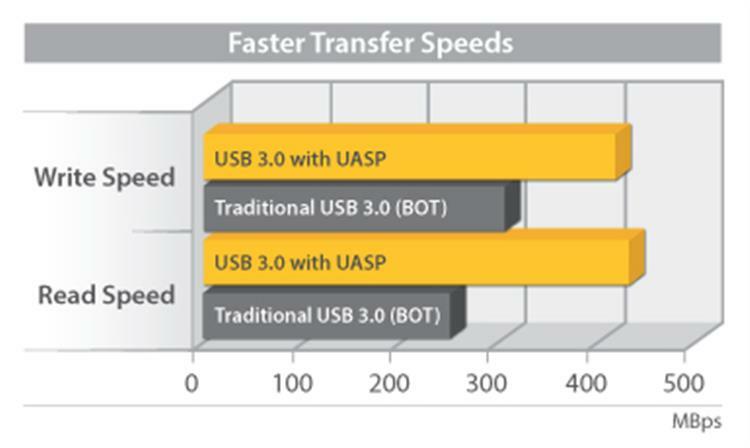 In testing UASP performs with a 70% faster read speed and 40% faster write speed over traditional USB 3.0 at peak performance. At the same peak in testing UASP also shows an 80% reduction in required processor resources. 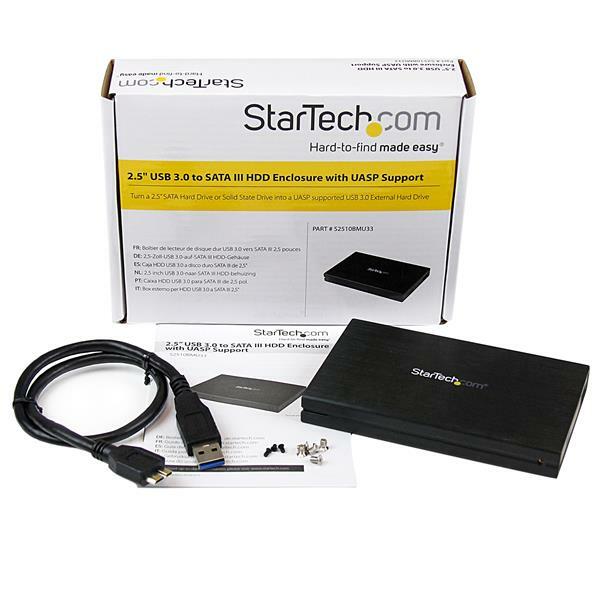 Testing results were obtained using an Intel® Ivy Bridge system, a UASP enabled StarTech.com enclosure, and a SATA III solid state drive. How can I tell if my hard drive enclosure can power my hard drive? Hard drive enclosures require power from your system's USB port. Although you can plug in any standard SATA drive, USB ports only supply a limited amount of power and are not able to power all of the hard drives plugged into the system. The power capabilities of the USB port combined with the power requirements of the attached hard drive will determine if the hard drive enclosure will work in your setup. The power (in mA) supplied by the USB port must be greater than the requirements of the hard drive. A USB 2.0 port can supply a maximum of 500 mA (0.5 A), and a USB 3.0 port can supply a maximum of 900 mA (0.9 A). You can usually find the power requirements of your hard drive in the technical specifications on the label of the hard drive or on the manufacturer's website. Will my hard drive work in this enclosure? Make sure that the enclosure supports the storage size of your hard drive. If the storage size of your hard drive is larger than what the enclosure was tested with, the hard drive will likely still work with the enclosure. Confirm that your hard drive uses the same interface type as the enclosure. For example, IDE, SATA, or M.2. Make sure that the enclosure supports the physical size of your hard drive, such as 2.5 inches or 3.5 inches. Make sure that the enclosure supports the height of your hard drive. For example, 9 mm or 15 mm. Verify that the power consumption of your hard drive doesn’t exceed the power output of the enclosure. If you’re using multiple hard drives, make sure that the combined power consumption of all of the hard drives doesn’t exceed the power output of the enclosure. Use the cables, hard drives, and hard drive enclosure in another setup to see if the problem is with the components or the setup. Use a different cable, hard drive, and hard drive enclosure in your setup to see if the problem persists. Ideally, you should test a component that you know works in another setup. If the hard drive is listed as healthy but does not have a drive letter, for example, C:, right-click healthy and click Change Drive Letter and Paths. Click Add, assign a drive letter, and click OK.